Last summer, Deputy Secretary of Homeland Security Claire Grady issued a warning to employees that they were under "heightened threat" based on "specific and credible threats that have been leveled against certain DHS employees and a sharp increase in the overall number of general threats against DHS employees." Among those she was referencing were agents of DHS's Immigration and Customs Enforcement (ICE) who, as a group, had come under threat from violent extremists furious over the interior enforcement of immigration law and President Trump's policies. As I wrote at the time, extremists issued implied threats and encouraged the murder of ICE agents from mostly anonymous online perches, as do ISIS propagandists who become the targets of hellfire missiles overseas because their incitement has proven so mortally effective. At one point, home addresses and other presumably private information of thousands of agents were doxed, or made available to potential extremists, no doubt ramping up the sense of unease as planned. So far, so good, though. No ICE agents have been attacked or murdered by domestic extremists in the months since ICE officers began taking extraordinary precautions. But continued vigilance is warranted because hatred toward our federal officers remains high. 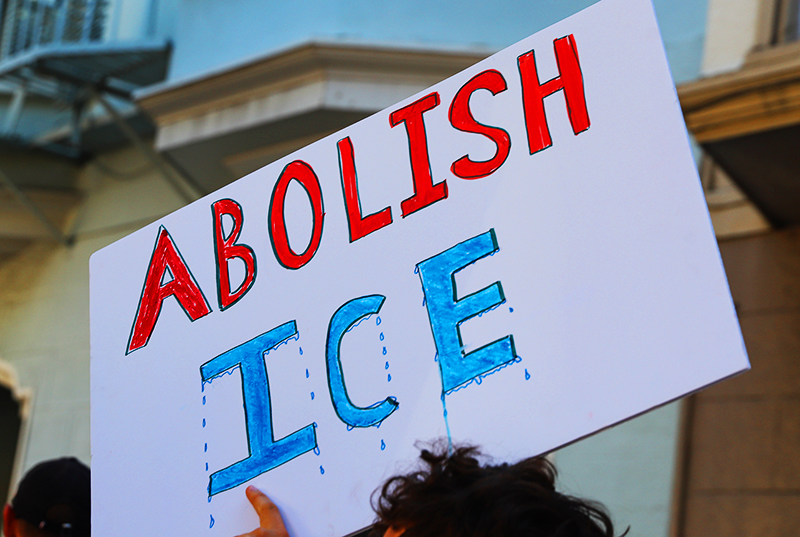 As recently as December 30, the acting head of ICE, Ronald Vitiello, told the Associated Press, "There is a tension around. It could be that somebody could find out what I do and hate me for it or do worse than hate me for it." Vitliello said the agency was continuing to monitor social media and provide employees with unspecified "resources" for when they feel threatened. Law enforcement is inherently dangerous, and ICE agents get no pass on that. I once extensively covered a Palestinian crime gang's repeated plots to murder ICE special agent Scott Springer for busting up their gang. But this is different because the motivation is rooted in an ideological desire to cause political and social change, the very definition of terrorism. The only two known arrests related to the threat provide some insight as to what the online-based threat against ICE agents looks like, though these are hardly the only ones out there calling for the deaths of our agents for a political agenda that include abolishing the agency or simply returning its troops to their barracks. The first involved Sergio "Mapache" Salazar, an 18-year-old DACA recipient who came under FBI national security investigation for allegedly posting anonymous threats to make bombs that would be used to kill ICE agents. Salazar was under investigation for instructional videos on how to make certain unspecified weapons and countering law enforcement, according to local news reports. Salazar was participating in anti-ICE protests outside a San Antonio facility on August 3 when he was finally arrested on a technical immigration law violation to get him off the streets while the FBI finished up a counterterrorism investigation, which had gone on for at least a month and was so serious it required covert surveillance of his home and social media. Ultimately, 21 pages of Salazar's online postings compiled by the FBI were waived in immigration court for potential public release, the effect being that Salazar and his RAICES attorneys felt compelled to instead take a forced deportation to Mexico (with its 10-year ban on reentry) rather than fight for the kinder voluntary departure, after which he could reenter sooner and more easily. ICE and the FBI fought the latter on national security grounds. In Monterrey, Mexico, now, Salazar and his supporters have relentlessly pushed a gap-ridden narrative that ICE and the FBI railroaded him strictly as retaliation for his lawful protest activities. To keep that narrative pure, the bomb-making threats and online postings calling for the murder of ICE agents are never mentioned.. But in a recent podcasted slip (around minute 27), Salazar acknowledged the FBI told him they preferred his deportation because, "if you're in Mexico, we're not worried about you." He said that if he fought for the gentler voluntary departure option and was denied as expected based on the FBI evidence, "the judge would probably have to give a reason ... and that reason probably could have been national security threat, and that would be on my record. Essentially, national security threat is not good. It sounds like they would label me as a terrorist and that would be on my permanent record." That would be because posting how to make bombs to kill federal officers does not a good future citizen make. Salazar also recounted how the FBI asked him to inform about any illegal activities involving others that were part of the national security investigation. Salazar boasted that he was no snitch. "Obviously, I didn't tell them anything." "What animates an FBI agent to come and question them about their friends and about a movement they were part of. What is it that they want to protect so bad that they're willing to go ... so [expletive] low?" Unwillingness to tell police about potential criminal activity is not exactly an indication of good future citizenship either. At about minute 47:43 of the podcast, Salazar also betrayed a continuing animus toward ICE and the FBI, all of whose employees he dehumanizes as "liars and snakes". "I could tell anybody first hand, anybody who works for ICE looks like the most miserable piece of [expletive] on Earth. They all look like demons. I don't know what it's like to work for ICE, but they don't look like humans anymore." "What is it? What do you stand for? And is that thing you stand for worth it if this is your job? That's something every ICE agent, every FBI agent, every border agent, every security guard needs to ask themselves." The expressed sentiment might help explain the whole bomb-making thing that was under FBI investigation. Elsewhere, the case against Brandon Ziobrowski of Cambridge, Mass., appears to be moving slowly. On August 9, FBI agents arrested the 33-year old anti-ICE activist and had him federally charged with using Twitter to offer at least his 448 followers $500 to "anyone who kills an ICE agent. @me seriously who else can pledge ... get in on this ... let's make this work." Two people who "liked" this message had their accounts suspended. Earlier, Ziobrowsk replied to a tweet from an ICE field office director noting that agents put their lives on the line to arrest criminal aliens. Ziobrowsk repled: "Thank you ICE for putting your lives on the line and hopefully dying I guess so there's less of you?" He also tweeted that guns should only be legal for shooting police officers and that "[Expletive] this police state shooting a cop should get you a medal," records show. He repeatedly tweeted his desire to slit the throat of the late Sen. John McCain. The arrest warrant affidavit and indictment alleged that Ziobrowski's tweet was designed to encourage violence and the murder of federal law enforcement agents. Ziobrowski, who has pleaded not guilty, is free on bond and living in New York. Court records from the case show virtually no movement and reveal no new revelations. In October, authorities found that he violated the terms of his release by having two cellphones without the required internet monitoring software. These were flip phones that had Internet access that he didn't report, where he could have potentially used social media outside of court monitoring. Also in October, his attorney asked for more time to prepare a defense and asked for a status conference with prosecutors this month. In November, Ziobrowski asked the court if he could have his passport back so he could submit it to a new employer. The employer needed the photo ID for the Real ID program.